We recently celebrated my husband's birthday with dinner with friends and family, a Longford's ice cream cake and a highly anticipated iPad 2 gift from yours truly. Since the fateful day of gift-giving, there is not a single conversation in my house that isn't prefaced by or concluded with, "is there an app for that?" or "Sorry, I wasn't listening to anything you just said because I'm playing angry birds". Call it inspired or obsessed, our house has iPad fever (as well as an acute case of Bieber fever, but that's not the topic of today's post). Now any ol' bride can conduct a search for iPad wedding planning tools, of which there are many, but I've compiled a list of the less obvious but equally as helpful apps to consider using for your wedding. Pinterest gets top billing because it has revolutionized my life (and soon yours as well) forever. Bold, I know. But for all of you out there who clip, cut, copy & paste photos from the interweb into every nook and cranny of your desktop, this site will make you gag (in a good way). Not only does this site help you collect photos from the web, it also lets you sort by building boards (I'm thinking "hair and makeup ideas", "wedding dresses", "centerpieces and decor", "cute favor ideas", etc.) that include links to the source, meaning if you save a photo of a great bridesmaid's dress from J. Crew or the such, you can click on the photo and it takes you right to the dress' page on jcrew.com. Um, yes please! So for example, some of you (hi, mom) may have checked out this Love the Look, Steal the Style post on Imperial No. 9. 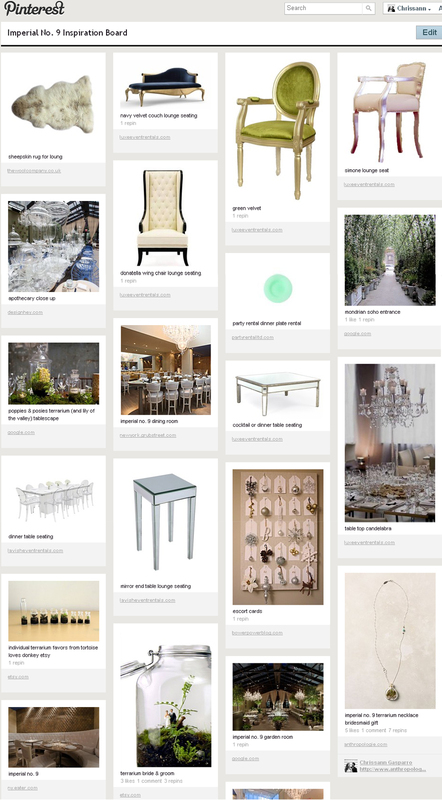 Here's a screen shot of my curating as seen on Pinterest. In love yet? Plus, you can allow others to contribute to boards and also see what your friends are collecting on Pinterest, too. So no more emailing photos back and forth to your planner, your mom or your maids. Note that you must request an invitation from pinterest.com and register an account via the email invite they send you prior to simply downloading the app. Then you're done, ipso schmipso. When I was pregnant with my duckling, I did this self-hypnosis home study program to prepare for birth that was as silly as it was addictive (even my husband started asking to listen to the tracks). One of the things you learn to create is a protective & imaginary "bubble of peace" to deflect any negativity or stress. 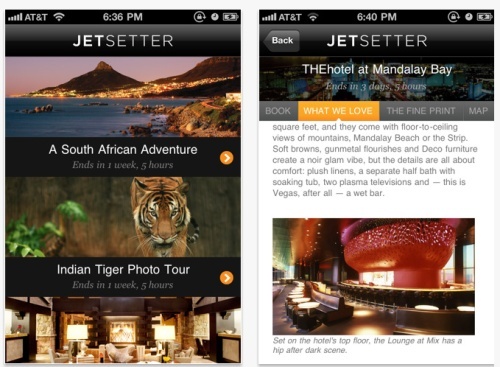 Think of the Jetsetter app as your bridal bubble of peace, that calm place you retreat to to escape wedding worries, in this case an ipad app chock full of gorgeous travel eye candy. Look up resorts in Bora Bora, gorgeous hotels overlooking the Place Vendome, and pretend you never have to return to the land of menu selections and seating assignments. Or use it plan your honeymoon. Whichever. I love this app, and it has so many uses beyond simply wedding planning (which actually could be said about all the app's we're discussing today, so that's an added bonus). You hear a song come on at your coffee shop that is just perfect for your first dance, but you have no idea what it's called - SoundHound to the rescue. This app recognizes songs by sound (like the other popular app Shazaam), identifies the artist and title and gives you the option to purchase the tune right then and there. Use this to pick songs for your band, for your ceremony or your after-party ipod mix. PS - There is also an app called My Wedding DJ, where you can create your own playlist, complete with pauses between songs (like right before the bride walks down the aisle). Brides ask me occasionally about DIY playlists. Since we are in the bubble of peace together, and we're holding hands, I'm going to give it to you straight - using an ipod as your wedding DJ is a bad idea. Not 100% of the time, but definitely 99% of the time. Bad music will ruin your wedding. Period. Invest in this handy tool, using your ipad camera to scan all your important wedding documents. From floor plans to contracts, ScannerPro enables you to have an e-copy on hand at all times to avoid any confusion or ambiguity. So, when you sit down with your florist, and she asks how many tables there will be in your cocktail hour, you can pull up the floor plan your venue sent you and say "seven tall boys and six cocktail tables". Or when your band says you didn't contract for a three-piece trio during cocktail hour, you can immediately access the contract to clear up any confusion. For all the photos you can't pin to your Pinterest boards, there's Evernote, a handy hybrid of snapshot and note-taking. It's sort of an in-between of your ScannerPro and Pinterest, half camera half notepad. I'm sure I'll stumble across a few more that I'll share along the way. And as a bonus, all but one app are free. Jackpot! Very nice article...i like your ipad apps for brides posting..i want to share about ipad apps in my life. A friend of mine who’s a successful wedding planner in North Carolina recommended two mobile apps for the iPhone and iPad: iWedPlanner is also available for the iPad and iPhone.iWedPlanner app focuses on wedding arrangements, dresses, jewelry and cakes etc. for a wedding or a honeymoon. It's nice blog post site. now, the brides peoples are use more iPhone, iPod, iPad apps. so the wedding app is launch a new wedding related apps for planning a easy weddings. i'm sure the brides are use this app and enjoyed.